A campaign worker went down to Antoine Thompson’s campaign HQ this past Thursday – two days after Thompson lost a primary to incumbent Crystal Peoples-Stokes – and says he got the crap beat out of him. Christopher Patterson, 37, said in a police report that Thompson held him down at his Assembly campaign headquarters on East Delavan Avenue, two days after the candidate’s defeat in the Democratic primary for Assembly. He also said two others, Neil Mack and Rashad Howard, punched and kicked him. He said that the assault caused him pain and abrasions to the back of his neck and that he needed to seek treatment at Sisters Hospital. That whole thing will play itself out on the criminal and civil dockets, but congratulations seem to be in order for Mr. Thompson, who has evidently recovered nicely from the injuries he allegedly suffered in a fender-bender; injuries that were so mild that he used the experience as an effort to weaken the state’s no-fault threshold of “serious injury” for car crash lawsuits. The most amazing thing about Thompson’s attempt to re-enter the political arena is that Crystal Peoples-Stokes and Byron Brown basically gave him the best gift – a job when he needed one, a couple of years after Mark Grisanti kicked him out of the State Senate. Maybe he can get a job advising the Weppner campaign? They seem made for each other. The Buffalo Employment and Training Center (BETC) is a Buffalo city agency that exists to help people find jobs. It works with applicants to try and match them with prospective employers, and has a roster of companies and agencies with which it works. It would make sense that the person whom the city retains to operate BETC would have some significant and meaningful experience in the field of hiring, human resources, or recruiting. Antoine Thompson spent his political adolescence being groomed by the Grassroots political club to be the next Byron Brown. 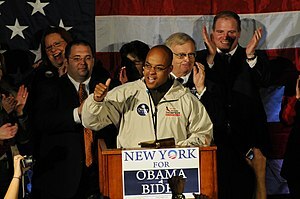 His ambition often seems to be in adverse proportion to his abilities; he started out in the Common Council as Brown’s appointed replacement, and within just 4 years was sniffing around Louise Slaughter’s congressional seat because he was upset that the party leaders had not picked him to replace then Mayor-elect Brown in the senate. Thompson eventually made it to the senate in 2006 when, with the support of Brown and Grassroots, he defeated Marc Coppola. It should come as no surprise that the Thompson/Coppola battle of 2006 forms the genesis of the hostility between the Lenihan and Brown political factions. Thompson then defeated then-Democrat Mark Grisanti in a primary race for the 60th Senate District seat in 2008. Grisanti ran as a Republican in 2010 and defeated Thompson that year. Since leaving government, Thompson has worked on the periphery of politics, nominally a real estate agent but also operating a newspaper and writing web pieces for former Joe Illuzzi associate Glenn Gramigna. Throughout his short walk in the wilderness, Thompson has been seen at so many fundraisers and political gatherings that it was merely a matter of time before he jumped back into the life. In recent months, Thompson and Grassroots had been estranged from Byron Brown and his city hall political faction. Apparently, there’s been a rapprochement. This week, Mayor Brown appointed Mr. Thompson to become the head of BETC. The job pays almost $80,000 – more than what a state senator makes, exclusive of per diems and lulus – and Thompson’s experience in the private sector amounts to the last two years during which he’s been working as a real estate agent. Investigative Post’s Jim Heaney surmises that this hire gives Brown some cover against charges that his administration is overwhelmingly Caucasian. Perhaps, but this also placates Thompson and effectively removes him from politics, and therefore as a threat to Brown. It releases a pressure valve that would have conceivably seen Thompson challenge the Mayor in 2013, or one of the mayor’s allies in some other race. Antoine Thompson’s qualifications to run BETC are non-existent. Given his track record in elected office, I am at a loss to explain what position he may be qualified to hold in any arena. This is clearly a patronage hire, and a lucrative one, at that. But it’s the mayor’s position to fill, and he can select whomever he pleases. If Thompson’s track record of ineptitude continues, it will be Buffalo job-seekers who will be victimized by it. Thankfully, this isn’t one of those patronage scandals where a new position is created out of whole cloth in order to placate or reward a political associate; he is being hired to fill an existing position. Perhaps this is a good thing. Perhaps containing Antoine Thompson is the best way to limit the damage that he can do. Think of it this way – while this hire may be simply horrible for people who turn to BETC for help, it may be good for the community at-large. With Antoine Thompson running a city agency for a decent salary, he has been effectively removed from the world of elected office. That means that we won’t have him running around trying to position himself for a return to the state senate or some other representative office. Micro loss, macro win. Maybe we collectively dodged a bullet here, folks. Antoine Thompson returns to Albany, replacing Tim Kennedy. Byron Brown goes to Washington, replacing Brian Higgins. Tim Kennedy moves into the 2nd floor of City Hall, replacing Byron Brown. All of these rumors are floating around town, gaining steam. So my question is, are we living a Stephen King novel? We’ve enjoyed endless schadenfreude over the last couple of years, watching the local tea party factionalize and bitterly fight over stupid crumbs. (The root of the rift seems to center around last year’s crowded race in SD-59 to replace Dale Volker). One wing features libertarians and birthers, while the other wing features Palinists and birthers. One would think they could at least find common ground on Obama being an Indo-Kenyan Communist usurper. The glibertarian tea party is run by characters such as Jim Ostrowski and David DiPietro. They claim doctrinal purity, outsiderishness, and expressing hatred at some “political class,” which they are both firmly members of. The Palinist tea party is run by tricorner-clad Rus Thompson. They are more closely aligned with the Republican establishment, but tend to skew more right-wing and somewhat less pragmatic than the GOP committees. The Ostrowski wing denounces the Thompson wing as “TeaGOP”. Meanwhile, 99.9% of western New Yorkers couldn’t give a crap about far-out glibertarian thought, nor about fringe wingnut theory. Yesterday, the Ostrowski wing held an event at Brennan’s Bowery Pub to announce that it was endorsing Jack “I hate the browns” Davis for congress in NY-26. If you’re wondering how that may have come about, you should know that both DiPietro and Ostrowski are on the Davis campaign payroll. They claim to have abstained from the vote (results of which aren’t revealed), but really? At the same time, the Thompson-led group held a “candidate’s forum” near Niagara Falls within the 26th district. It was an event in a public hall, openly advertised as being open to all candidates and prospective voters. Except Ian Murphy from the Green Party. He was not permitted to speak, and instead was left handing literature out in the parking lot. The only candidate to show up and speak to this collection of political misfits was, of course, Jane Corwin. Miraculously, she got their endorsement! Wow! You can feel the excitement at the Corwin campaign as she dives headfirst into a stupid feud and panders to people driving 15 year-old Oldsmobiles defending the rights of billionaires to not pay taxes. And you can imagine the high-fives and sheer joy at Davis HQ when it was revealed that Davis’ own campaign staffers endorsed him! Wow! This politics thingy is fun! Corwin went so far as to Tweet her thanks for being endorsed by a bunch of conservative Republicans. Jack Davis’ Twitter feed seems to be filled with pandering to the gun fetishist vote. But what we’ve established is that the Palinist wing of the local tea party is fundamentally undemocratic and exclusionary. By excluding the Green Party candidate for being not “serious” they’ve betrayed the democratic process they so claim to defend and love. Ian Murphy may be using humor to run for office, but he’s also talking more substantively about issues than any of the other candidates right now, who rely on carefully crafted, focus-grouped messages designed to be sound and fury, but signify nothing. Destroying documents so that your incoming replacement is at a disadvantage, and instead merely handing over to him the “book of achievements” that helped you lose in the first place, is the mark of a protodictatorial egomaniac. Byron Brown and Len Lenihan had a falling out in 2006 because Byron Brown insisted on hand-selecting Antoine Thompson to succeed him (pun intended) in the State Senate. Lenihan refused, noting that neither Jimmy Griffin nor Tony Masiello had been given that opportunity when they shifted from the senate to become mayor, and that the interim replacement in the state senate would be the committee’s choice, and they chose then-councilman Marc Coppola. Coppola ultimately lost the primary in September 2005 to Thompson, who most recently lost his senate race against Mark Grisanti. Thompson lost that race in a district that skews overwhelmingly Democratic – a seat he would have normally kept for as long as he wanted. Now that Thompson has blundered his way out of office, and the underlying cause of the feud is rendered moot, there’s room for rapprochement. (Perhaps the diplomatic mediation communications between both camps should be published by Wikileaks and the Buffalo News). Brown and Pigeon re-aligned and have acted in an oft-concerted effort to motherf*ck Lenihan and ECDC at every turn since. The feud is ridiculous and petty and counterproductive and stupid. Paterson is right to bring it up, but wrong to bring it up so damned late. It’s astonishing that Brown’s camp took a “who, us? !” stance of gotta-be-feigned incredulity. Pigeon is probably busy trying to find a new sugardaddy to fund his ruination of WNY and state politics now that Golisano is firmly ensconced in Florida and Pedro Espada is cooling his heels in Mamaroneck, waiting to see how that whole indictment thing plays out. “[It’s] competition to see who stands on the smallest hill,” indeed. Antoine Thompson will not be the State Senator for the 60th Senate District next session. Still trailing by 527 votes, and losing the financial support of the Senate Democratic Campaign Committee, his campaign withdrew its challenge and the court case was dismissed. On election night, I predicted that this race would go to a recount. Republican Mark Grisanti will go to Albany, and I wish him well. He says that Thompson has not called him to congratulate him or concede, nor did Thompson mention his successor in his press release yesterday afternoon. Sore loser. Although this result may end the Democratic state senate majority, that’s ok. That majority was rife with corrupt people doing corrupt things, led by tone-deaf dummies. Among them was majority whip Antoine Thompson. The last two Buffalo mayors had basically used the 60th District senate seat as their stepping stone to City Hall. It had widely been anticipated – and feared – that Thompson may do the same; that he was the Mayor-in-Waiting until Mayor Byron Brown found a better gig. With a big Democratic enrollment advantage in that district, Thompson should have easily held on to that seat barring some horrible scandal. That he let this get away from him is a massive failure, and underscores how dissatisfied his constituents were with him and his “service”. He was pilloried constantly for his profligate spending on mailers and turkey giveaways and other palm-greasing. He was the very embodiment of the sleazy Albany pol. Although he was a proponent of gay marriage and the environment, that hardly made up for his self-aggrandizement. Mark Grisanti has done the entire region a huge service. By possibly putting an end to that despicable Democratic failure of a senate majority, he may have also done the state a huge service. In Erie County, Thompson is up by 3,332. In Niagara County, Grisanti is up by 3,074. That’s net +258 for Thompson with two election districts still unreported. This is epic, not only because Thompson is very close to being ousted, but because the balance of the state senate remains unclear this morning. We had a late night last night, so I’ll have more later.